PNNL microbiologist Josh Powell looks at anthrax spores, which have developed into bacteria over the course of 12 hours. At low doses, researchers found growth of spores is lower in human lung cells than rabbits. 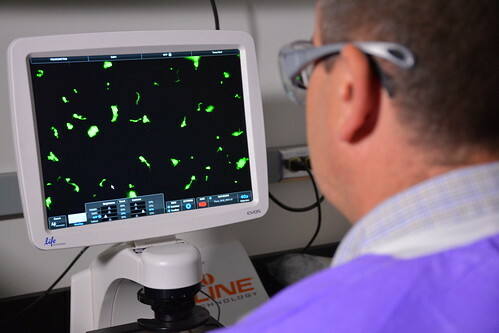 PNNL microbiologist Josh Powell views anthrax bacteria and spores magnified 400 times. 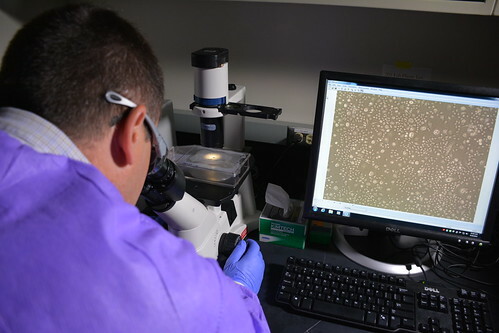 His research shows anthrax grows differently in rabbit and human lung cells and between cancerous cell lines and normal cultured cells from each species. PNNL Microbiologist Josh Powell combines specially cultured rabbit lung cells with anthrax spores to get a better understanding how rabbit anthrax data compares to findings from human cell cultures. Human lung cells magnified 200 times. 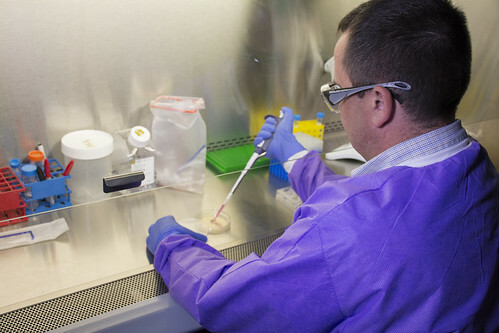 PNNL microbiologist Josh Powel studies how normal human lung cells react differently to anthrax spores than the cancerous cell lines typically used in research. RICHLAND, Wash. — Cultured human lung cells infected with a benign version of anthrax spores have yielded insights into how anthrax grows and spreads in exposed people. 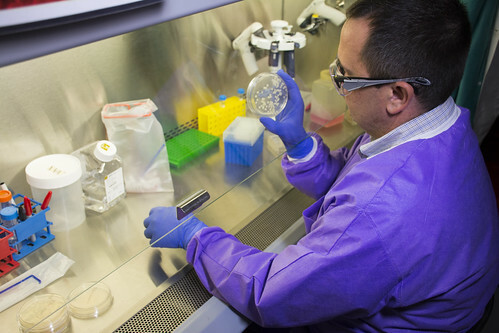 The study, published in the Journal of Applied Microbiology, will help provide credible data for human health related to anthrax exposure and help officials better understand risks related to a potential anthrax attack. The Department of Homeland Security Science and Technology Directorate funded this research. All images were acquired with a specialized confocal microscope at EMSL, the Environmental Molecular Sciences Laboratory, a DOE Office of Science user facility at PNNL.